May 17th, 2014 marked the 60th Anniversary of Brown v. Board of Education, the landmark Supreme Court Decision that held state laws establishing separate public schools for black and white students as unconstitutional because they violate the Equal Protection Clause of the 14th Amendment. Today, some six decades later, many parents and teachers are still worried that America’s children are not receiving equal access to education envisioned in that case. On this episode of Lawyer 2 Lawyer, hosts Bob Ambrogi and J. Craig Williams shed light on this issue with guests Christian D’Andrea from the MacIver Institute and Kyle Serrette from The Center for Popular Democracy. Together they discuss private schools, charter schools, and homeschooling vs. the community school model. Tune in to learn more about funding concerns, oversight issues, and the proper role of teachers unions in the school choice debate. Christian D’Andrea is an Education Policy Analyst with the John K. MacIver Institute for Public Policy in Madison, WI. He earned his Master’s of Public Policy degree at Vanderbilt University and has previously worked for the Friedman Foundation for Educational Choice as a State Policy Director and Policy Analyst. He is the author of several studies that examine the fiscal and personal impacts of educational reform, and his work has been featured everywhere from the Huffington Post to EducationNext. Kyle Serrette is the Director of Education Justice Campaigns at The Center for Popular Democracy and works with their partner organizations to strengthen their public education coalitions, develop strategy to help close the opportunity gaps, and coordinates national and regional campaigns that work to bolster our public education system. Prior to joining The Center for Popular Democracy, Kyle spent over 10 years working on corporate campaigns with groups such as Service Employees International Union, Change to Win, and the American Federation of State, County and Municipal Employees. He was awarded the 2010 Joe Hill Organizing Achievement Award by the LA Fed and the Los Angeles Orange County Organize Committee. Many of our upper middle class, and rich areas have well-provided schools, but our challenge is investing in strategies that are successful in our lower middle class, or all populations, and that’s where we’re really struggling. We’ve spent a lot of time trying to figure out what is that strategy that turns those schools around, and we’ve found them. The problem is that they’re not being implemented. 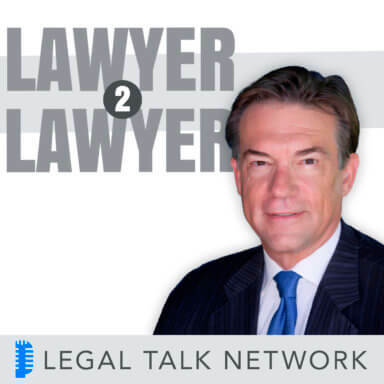 Welcome to the award winning podcast, Lawyer to Lawyer, with J. Craig Williams, and Robert Ambrogi, bringing you the latest legal news, and observations, with the leading experts in the legal profession. Craig Williams: Hello, and welcome to Lawyer to Lawyer on the Legal Talk Network. This is Craig Williams, coming to you from southern California. I write a legal blog called May it Please the Court? Robert Ambrogi: Yeah, this is Bob Ambrogi, coming to you from just outside of Boston, Massachusetts, where I write a blog called Law Sites, and also a blog called Media Law. Craig: Bob, before we introduce today’s topic, we’d like to thank our sponsor, Clio, an online practice management software program for lawyers at go Clio dot com. Robert: Craig, May 17th century marked the 60th anniversary of the landmark Supreme Court decision Brown versus Board of Education that had State laws establishing separate public schools for black and white students as unconstitutional, in violation of the equal protection clause of the 14th Amendment. Today, some six decades later, may … parents and teachers are still worried that America’s children are not receiving equal access to education, as envisioned, in that case. As a result, some feel we need alternative schooling options for our children, but others believe the solution lies within a stronger public school system. Craig: And here to discuss that topic, we welcome Christian D’Andrea. He is an Education Policy Analyst with the John K. MacIver Institute for public policy, in Madison, Wisconsin. He earned his Master’s, a public policy degree at Vanderbilt University, and previously worked for the Friedman Foundation for Educational Choice, as a state policy director and policy analyst. He is the author of several studies that examine the fiscal and personal impacts of educational reform, and his work has been featured everywhere from The Huffington Post to Education Next. Welcome, Mr. D’Andrea. Christian D’Andrea: Craig, thanks so much for having me on. Robert: In addition, we would like to welcome to today’s show, Kyle Serrette. Kyle is the Director of Education Justice Campaigns at the Center for Popular Democracy, where he works with their partner organizations to strengthen their public education coalitions and develop strategy to help close the opportunity gaps. He coordinates national and regional campaigns that work to bolster our public education system. Prior to joining the Center for Popular Democracy, Kyle spent over 10 years working on corporate campaigns with groups such as the American Federation of State, County and Municipal Employees, the Service Employees’ International Union, and Change to Win. In 2010, he was awarded the Joe Hill organizing achievement award by the LA Fed, and the Los Angeles Orange County Organized Committee. We’d like to welcome Kyle Serrette to the program. Kyle Serrette: Thank you. Glad to be here. Craig: Christian, maybe I could start with you, and before we really get into the topic, let me ask you, for the benefit of our listeners who aren’t familiar with your organization. To tell us what you do and where you stand on this question on school choice options. MacIver Institute is a free market think tank, founded back in, I believe, 2010, so we were right here on Capitol Square when everything went down with Scott Walker, Act 10 and the Madison Wisconsin protests. I was with my fourth year of the organization, and I came over from the Friedman Foundation as a School Choice and Educational Policy Analyst, so, where we stand in terms of school choice options … Obviously, we’re believers in a free market, having more options, and basically giving parents more options … more access to these options as the way to help … not only improve student performance, fund [inaudible 00:04:27] classrooms for students that need it, but also as a way that can help our public schools succeed as well. Kyle:And Kyle, can we get a little background from you, on your organization as well, and perhaps a little bit of an explanation about the range of school choices that are available. Just as a layman, I understand we have public schools, private schools, charter schools; I’m sure a whole bunch of other schools that I don’t even know about. Kyle: The Center for Popular Democracy is one of the largest networks of community organizations that are around the country, and the issues that we work on are largely the issues that affect people that find themselves in poverty, so, whether that be public education, or voting rights, or racial justice, or immigration justice, economic justice, we work form both a policy standpoint, but also from an organizing standpoint, to push for policies and programs that will improve opportunities for those populations. Where we stand on choice, and all the different options that are out there, we really are a faith believer in improving strategies, that lead to wonderful outcomes, and we’re not really for choice for choice’s sake. If you have a lot of choices, that could be great, but if some of the choices that you’re given are of the most quality, as we know a lot of our communities are face with, then we challenge communities to find the strategies that have worked, or similar places, like their community, rather than choosing any option that may be experimental, and hasn’t proven itself. Craig: Christian, what are the choices? Christian: In … I don’t know where you’re looking, but obviously, in states like Wisconsin, up here, Georgia, Pennsylvania, and what have … You’ve private school choice options, whether it’s through the voucher program, or tax credit scholarship, but for other states that don’t necessarily have private school choice options, you have open enrolment that can take you form a traditional public school, to one in a different district. You have home-schooling. You have charter schools, both instrumentality and noninstrumentality, that provide a little bit less oversight, but more freedom and capabilities, and choose curriculum, and poised e-plans. You also have home-schooling … virtual schooling. There are similar options, and there are more and more techniques, and efforts are going into expand the state of K-12 education in America today, even if it’s not … doesn’t include a private school choice program. Robert:I’m interested in what both of you think about the question of choice as a civil rights issue. You may have … I’m sure you’ve thought about this before, but there was a Op Ed on CNN … the chairman of the Republican National Committee published this Op on the anniversary on Brown versus the Board of Education, talking about choice as a civil rights’ issue, 60 years after Brown. Do you see it that way, Christian? Let me ask you that. Christian: If anything, I feel lie school choice offers parents a way to alleviate residential segregation, by allowing then greater access to schools outside their own neighborhood. One of the biggest issues that all schools face right now is that unless you have the money to go elsewhere, you’re locked into your school, based on where you live. By offering more school choice options, and this includes things like open enrolment and inter-city transfers. Up here, we have something in Wisconsin called Chapter 220 transfers, which help students get … with their own local public school, and the less segregated schools by expanding those options, you give parents the opportunity to move beyond just their local choices, and find a school that not only fitted their students, but maybe gave them a greater cultural depth. Robert: Kyle, what about you? How do you see that issue? Kyle: We’ve been following a number of studies. I think the biggest one was out of UCLA, but there’s a lot of smaller ones that have shown that the charterization of our cities has left them increasingly segregated, so that’s not in the direction that we think it should be going. Of course, Brown versus the Board of Education was meant to deal a blow to segregation, and, I think, unwittingly were seeing a situation where since 2000, the number of students enrolled in charter schools has doubled 3 times, and while that happened there’s some consequences of that, and one has been this increasing levels of segregation, so I think that we just need to analyze what we’re doing in this free market, let a million flowers bloom, and try and figure out some of the consequences of the headlong strategy. Craig: As we wind our way through this, are we finding, really, that we still have a race issue, or is it a money issue? What’s the root of this problem? Christian: For me, I think it’s a culturally based problem, starting in neighborhoods and bleeding into the schooling from there, so, when you offer … even in a place like Milwaukee, for example, which is a very racially segregated city, they’ve had to deal with a lot of whites leaving, out of the city, into the suburbs. When you have something like fiscal choice programs which really from the … a lot of the city do expand … I’ve seen limits, even the county limits … You give parents more options to reunite with the former residents of this city, and really get back to that, more diverse, less segregated student bodies there. We saw that back kin the ‘90s, before it took a turn for the worse. Robert: What about this cost issue? Are charter schools, and other choice options, diverting funds, away from the public schools, and diminishing the quality of the public schools? Christian: I don’t mean to [Inaudible 00:10:29], here are jumping before you can see anything, but the funding aspect of choice in charter schools is something that’s often very, very easily … but, the bottom line is that choice only takes aggregate funds from schools where students are not … and students and parents are not satisfied. I agree schools that are retaining their students don’t have to worry about … and they’re naturally insulated from school choice programs, because parents and students are happy. Additionally, your voucher, or tax credit scholarships, or even your charter school per student funding numbers are, typically, significantly less than per student funding from your traditional public schools. Then, you have other things on top of that: declining enrolments, even … just the way most finding formulas work. I know about here, about Wisconsin, but across the country, that, keep them from being too badly damaged on a year- by-year basis, but also lead to more depressed student funding. Now, I know that sounds rocky, but when you lose students, you don’t have to worry about educating them anymore, but a percentage of them are either … were sent out for [inaudible 00:11:32] the voucher, remains with the district, the funding district. That leads to a bigger pot for less students, and that leads to more per student funding in the area, and we’ve seen that here in Wisconsin. The Milwaukee Parental School Choice Program, over a 20 year period, has saved about $300 million statewide. It’s saving about … depending on how many figures you look at, about $40 million dollars a year right now, so it’s because the voucher amount is so much lower than the per student funding number in Milwaukee. Craig: Why are public schools failing? Can’t we concentrate our money, instead of vouchers, and other programs; can’t we concentrate our money on fixing the system that we have? Kyle: There is a popular perception that public schools are failing, but, it’s too broad of a net to cast. If you go to most of our upper middle class areas, you’ll find that our schools are amazingly good, in those areas, and, we actually find that, in a funny way, people are going to places like Finland, and South Korea, and China, all over the world, to figure out what folks are doing to have great education systems, when they could look internally. If you look at the PISA numbers, or any of the testing numbers that compare, many of our upper middle class and rich areas have well-performing schools, but our challenge is investing in strategies that have … that are successful in our lower middle class, or, poorer populations, and that’s where we’re really struggling, and we’ve spent a lot of time trying to figure out what is that strategy that turns those schools around, and we’ve found them. The problem is that they’re not being implemented, so, we have places like Union City, New Jersey, where they implemented something along the lines of what you would call a community school model, and, in 1999 … and this is one of the most impoverished areas you can imagine … in 1999, they had math scores that were 42% proficient, and reading scores that were 32% proficient, and by 2007, the math scores went from 42% to 69%, and reading went from 32% to 76%, and this was without privatizing our education system, and Union City just advertised one of many examples of this … they turned themselves around, because they used proven research, and proven strategies to work with populations that are poor, in order to succeed. Robert: Kyle and Christian, we need to take a short break before we go on with the show. We will be back in just a few moments to talk more about the question of school choice in this 60th anniversary of Brown versus the Board of Education, so stay with us. We’ll be right back. Kate: Hi, my name is Kate Kenny, from Legal Talk Network, and I’m joined by Jack Newton, President of Clio. Jack takes a look at the process of moving to the cloud. How long does it take to move to the cloud, and is it a difficult process? Jack: No, with most cloud computing providers, moving your data into the cloud is something that takes just minutes, not hours, or days, to do. You can get signed up, and running, with most services, in just a few minutes, and even if you have an existing legacy set of data that you want to migrate to a web-based practice management system, like Clio, there’s migration tools, and migration services that we’re able to offer to ease that process. Most firms can be up and running in the cloud in less than 5 minutes, and can have their data imported in a matter of hours, or days. Jack: Thank you, and if you’d like to get more information on Clio, feel free to visit www.goclio.com. That’s goclio.com. Craig: Welcome back to Lawyer 2 Lawyer. I’m Craig Williams. With us today is Christian D’Andrea, from the John K. MacIver School for Public Policy, and Kyle Surrette, from the Center for Popular Democracy. Kyle, what role do teachers’ unions have in this discussion? Kyle: I think that they should probably should have a pretty big role because when we talk about teachers’ unions, what we’re really talking about is teachers. They are the ones who make up these unions, so, the educators are the ones who, if you’re going to ask them, “What works?”, then, you’re probably going to ask an educator, just like if you wanted to come up with a great policy on heart surgery, you ask the heart surgeon. Teachers’ unions have to have a role with their advocacy organization hat on, to put forward the best policies that would work best in their populations. That example that I gave recently, about Union City, it’s 100% union there and they worked the district to really put together a collaborative strategy to win. The problem that we see, oftentimes, is when we start antagonistic, and we don’t look for the bridges that we need, in order to succeed for the children. Robert: Kyle, you’ve just published a pretty big study on … the title of the study is Charter School: Vulnerabilities to Waste, Fraud and Abuse, and you’ve found that there is … at least, what you’ve found, is that there’s a lot of waste of money that’s gone to charter … That sometimes there’s a fraudulent waste of money. Is this something that charter schools themselves, in your view, are particularly susceptible to, or is this something that’s endemic to educational institutions of any kind? These are examples that we found in our report. We didn’t do any new research to uncover new fraud, we just looked at what Federal officials had prosecuted, and we just looked at 15 major charter markets, and we found over $100 million in waste, fraud and abuse. If you had to ask us, “Why?” it’s mostly because there’s no investment in the oversight to capture it, so, you find that there are certainly charter operators that are committing fraud for 5 or 10 years, but in the public system, a lot of times, that is caught in 1 year, 2 year, because the oversight mechanism is thorough enough. Robert: Christian, would you agree, there’s more oversight required here required here of some of these school choice options? Christian: Absolutely. More accountability is the key. The problem is how do you institute that kind of accountability, not only at administrative level, but in student data question level, without severely hampering, and stepping on the toes of the methods that make these schools unique? We’ve had up here in Wisconsin that’s been driving people nuts, we’ve gone over from the past 3 years, where we tried creating accountability for everyone that can be applied to all types of school that can access public funding, and none can really agree on what A, what constitutes a bad school, and B, what sanctions should be there. To Kyle’s point, it should be easier to make those kind of sanctions, and institute penalties, and create more oversights at administrative level. The problem there arises when you get into that student data question level and interfering with teachers, and curriculum, and what makes these schools … every school, not just your public schools, will make them unique? Craig: Let’s take this, and look at it from a practical perspective. If I’m a parent with a child in a school that I think is failing, and I want to pursue other options, where do I go? What do I look at? Who do I talk to? What steps am I supposed to take? Christian: That’s one of the things [inaudible 00:20:15] schools raise right now. We don’t really have that data collection that … Some states are moving out. Florida set the example of the school with report card grades, Wisconsin’s following it now, but, the big problem with the school’s choice is under informed parents. If an under informed parent that makes a bad choice, that helps sustain bad schools, and bad schools and bad actors don’t help anyone. When we go back to that accountability issue, very few people can understand what the constitution of a bad school, or agree on that, but everyone knew that you wanted to get the bad actors out, even the choice schools, because they knew that they make everyone … they drag everyone down. They provide the key argument against school choice, vouchers, tax credit scholarships. The key is getting the parents, and making them understand that what constitutes a good school, that there’s more than just achievement scores, that student grows is such a major, major aspect of understanding of how students perform in the classroom, and a lot of states are beginning to pick up on that. We’re seeing a reforming movement, that not only is working to hold more schools accountable, but teachers accountable as well, through simple grading, and simple progress reports that involve the community and use new systems of dissemination, and publication to help communities better understand what’s going on, that they’re the labor of a public school, and private school. I agree with Christian on parents have been proven to line up to schools that don’t necessarily have the outcomes that you think would cause a line to form outside that school. If you were talking about a parent, or parents, a group of parents, a community trying to decide what was the best choice for their community, given the lower performing environment that they were in, I would advocate for them to analyze the nature of their community, and figure out what has been successful there? Even CHIP has failed in some circumstance, when … the one is Denver, when they took over the whole middle school in 2005 … This is the situation when they took over a whole middle school, which fell off, outside of their operating model, and in 2009, they gave up, because they couldn’t do it, because they didn’t have the conditions that they usually have, which is, the most motivated kids in the neighborhood applying to those schools. So, if you were looking in your community for a scalable solution for everyone, that, that’s one example that … all that really has been proven to work in situations where selectivity comes to play. So, if you want to find scalable solutions, we really view community schools as a scalable solution, because it allows poor parents to model their communities after otherwise they’ve figured out what’s worked in various places. Christian: Is a great example of a successful church school that apparently doesn’t work in every situation. That’s just one sector of the school choice special, and if anything, that suggests that we need more options, more creative attempts, more diverse school backgrounds and operational stand offs, to the students that weren’t successful, and became more successful in their public schools, because obviously, they were, for the most part, that’s why they ended up in the academy. Give them another option beyond just a charter school that doesn’t fit them, or a public school that doesn’t fit them. Robert: Christina, from your perspective, what should be done from a public policy standpoint, to make sure those options are available? What are you looking to see if anything done at a legislative level to encourage school choice? Christian: It’s something I can take … several different paths. One of the easiest is expanding the scope of open enrolment in district. Up here in Wisconsin, we had a very limited application period, and we’ve expanded that from 3 weeks, to 3 months. That allows parents to do the research on the schools that aren’t only in their local school district, but they can do better, not only within driving distance, but, maybe, our virtual charter school, or similar aspects. The other way is that, from a policy standpoint, where we can see is … policy makers finding the schools that work … increasing the task force … finding the methods that are deemed successful, and replicating them. One of the big issues that we have is that we have a very strong network of non-instrumentality charter schools in Milwaukee, but we have no method to replicate an outside the city limits. There is no outside charter authorized to make those work, and regardless of how successful your schools are, they have no real room to grow. The biggest policy issue there is going behindways to not only expanding the options there, but it’s finding the methods that are deemed successful, and replicating them. Robert: Kyle, I know you come at from a very different perspective, but what would you be looking for from a policy level to provide for, at least, more inform … or choices about charter schools, and school choice, or to ensure fairness in school choice? Kyle: Yes … I come at it from … an organization that comes from a very similar standpoint. How could we expand existing quality models out there? Many of our members are in charter schools, and many of our members are in public schools. The only true scale of a model, that if you’re going to talk about how do you change it for a city, is to try and think about what are we doing to our public schools to turn those things around, for the ones that do need to be turned around? We’ve offered a community school model legislation, which you can find on our website, public democracy dot organization, which gives a road map to state, senate and assembly leaders and governors, for the exact policies that you would need to put into place in order to institute community schools. What a community school does is touches every point of what helps make out quality schools quality, so it goes from the very, very basic thing, of, if a child has trouble seeing, it’ll figure out a way to get that child to an optometrist. Or, if a child’s coming to school hungry, or with mental health issues, it’ll give the teachers the skills that they need to deal with 21st century students. If you went to school back in the ‘80s, or ‘70s, and now you’re trying to teach a population today, that can be very different, and out great researchers have figured largely what works, so, we’re really in the belief zone, we’ve had a lot of research untying, and figuring out how to innovate, and we have the models out there that are successful, so we view the 21st century as an implementation century, rather than trying to explore 20 million new ways to succeed with children. We are getting near the end of our program time, and wanted to make sure each of you had an opportunity to provide us with your closing thoughts before we wrap up the show, so, let’s get your closing thoughts, and also, as you do that, we’d like to ask you to tell our listeners how they can follow up with you, in your organization, and find out more about the work that you’re doing, so, Christian, let’s start with you. Christian: Degree point about Union City, and how response intervention was very successful. We were able to turn around the whole district. Unfortunately, those success stories are pretty few and far between, in both public and charter schools. If you take a look at the 2011 study Are Bad Schools Immortal? By Dr. David Stuit, he examines the districts over a 5 year period. Eighty percent of your public school districts rate in the lowest percentile of performance. Seventy-two per cent of your charter school districts … charter school remain in the same place as well. Those response intervention programs haven’t traditionally been successful, and that‘s why we need to keep looking for new methods, new techniques, and find the programs that work, and replicate them, while pushing the bad ones out. That’s what the heart and soul school choice is, it goes beyond just providing parents options, and providing the students the chance to match themselves with the classroom that fits them the best. It’s about finding the methods that work and expanding them to reach a greater audience. That’s it … My name is Christian D’Andrea. I’m the Educational Policy Analyst over school progress. You can find our stud at w w w dot MacIver Institute dot complaint, M A C I V E R, and you can find us on Twitter at MacIver wisc. M A C I V E R W I S C.
Kyle Surrette, your final thoughts, and how we can follow up with you? Number 1, we should look inside the United States, because there’s a reason why we’re the number 1 country in the world on many levels, including our education system, so we could really look at our rich areas, and figure out what they do, and they really just provide many of the great resources to these schools, to make them succeed. For any State lawmakers listening to this show, I’d urge them to act, because they’re neat things that are acting on trying to figure out scalable options, and they’re not acting on accountability, and, the ones that are paying for this are children, and largely our poor children. If you want to find out all the great things that TPD, the Center for Popular Democracy is doing, go to popular democracy dot organization, and surf around, if you go into the staff section, you’ll find information about me, and how to contact me. Craig: Great, thank you very much. Bob, this is our opportunity to offer our final thoughts, and we have 30 seconds to do so, so, you’re going to get cut off by the buzzer. Here you go. Robert: Craig, I … the concern that school choice options sometimes work to the advantage … disadvantage, rather, of inner-city schools, of poor schools, and of the less advantaged in our society. I worry about the diversion of funds and resources away from those who most need them. I think policy makers need to take a good hard look at this issue, give it some careful thought. I’m not sure that I … I know that I don’t know what the answer is, but I do remain very concerned about the potential for causing more harm than good through some of these school choice options. Craig: Bob, I agree with you on this one and having attended a private school, myself, as a child, I‘ve seen both sides from the student’s standpoint, certainly not from an adult, or a teacher, or an administrative standpoint, and certainly not legislative, but it seems to me that if you take resources away from the centerpiece of our education system, and that is public school K-12, you’ve pretty much taken money away from them. There’s just no 2 ways about it, so, offering additional choices, private schools, charter schools, home-schooling, really diverts resources from our main emphasis, and I think that we should focus all of our energies on the public school system. I don’t know that there’s a solution to this, but, that’s it, and there’s the buzzer. That brings us to the end of our show. This is Craig Williams. Robert: This is Bob Ambrogi. Thanks again to Christian D’Andrea, and Kyle Serrette, for taking the time to be with us today. Craig: Thanks for listening. Join us next week for another great legal topic when you want legal, think, Lawyer 2 Lawyer.